Clinical Professor Bill Musk is the Chief Investigator on an NHMRC grant for a long running cohort study of Wittenoom workers and residents to determine the impact of asbestos exposure on health, especially most recently psychosocial health and women’s health. The data collected from the study will be used to predict future cases of asbestos-related disease. He has collaborated with Professor Michael Hobbs, Bruce Armstong, Nick de Klerk and Alison Reid since 1975. As part of this process, a media research group from Murdoch University established this website as an information hub, and a questionnaire-based study by Professor Peter Howat from the Centre for Behavioural Research in Cancer Control at Curtin University examined the level of exposure to asbestos of people in the general community. 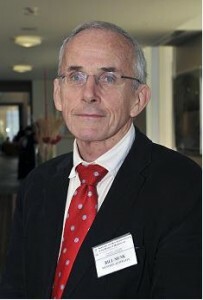 Professor Musk has been a respiratory physician at Sir Charles Gairdner Hospital since 1978, Clinical Professor of Medicine at the University of Western Australia since 1992 and Clinical Professor of the School of Population Health at the University of Western Australia since 1998. He has authored over 200 peer-reviewed articles, numerous reviews and book chapters in the scientific literature. His research focus is the epidemiology of respiratory diseases and cancer, particularly related to Wittenoom blue asbestos workers, Kalgoorlie goldminers and the Busselton population. His academic activities focus on the investigation of causes, prevention and treatment of occupational and environmental lung diseases and his clinical activities focus on the investigation and treatment of occupational lung disease and evaluation of disability. Professor Musk is also Chairperson of the Busselton Population Research Foundation, Chairperson of WA Mesothelioma Register, Past President of the Australian Council Smoking and Health and a Member of the Pneumoconiosis Medical Panel in WA. In 1992 Dr Musk was awarded Member of the Order of Australia for services to medicine in the area of asbestos-related diseases and smoking control. Professor Musk has also been a co-investigator on NCARD projects on the Genetic Understanding of Asbestos-Related Disease (GUARD) study with Professor Lyle Palmer and on the Effects of Asbestos Exposure in Aboriginal people from Roebourne and Balyugal study with Professor Richard Murray from James Cook University.